Tony’s Take on: The Humble Twin from the Dollar Shave Club | 5-6-7-8 Dancing My Way to a Healthy Me! The ridges give me a firm grip. Changing the blades is easy and quick. As you can see in the photo over to the right, my beard does not go all the way up and join with my sideburns; there is a gap. I can grow a full beard. But I like the style of beard shown in the photo. So that hair on the sides near my ears has got to be shaved. Underneath my beard, on my neck, my facial hair grows to below the collar line you see in this photo. When I get lazy and let it grow out for a week, it really bugs me when it rubs against the collars of my shirts…so that hair has got to be shaved on a regular basis. And the razor I use, The Humble Twin from Dollar Shave Club does the job. No problems. No nicks. I get a close smooth shave. And that is saying something folks because on one side of my neck, below the beard line in the photo but above the collar line in the photo, there is this weird circular growth pattern in my beard. I shave off all of that because no matter how much I trim, there ain’t gonna be no way to make it look pretty. It has to go! The Humble Twin blade handles the changing direction of the hair follicles with no problem. Note, In the past, I have used a 3 blade razor and a 4 blade razor getting them at the drug store. When my financial situation took a turn for the worse I looked around for options. First I went to a drug store brand of dual blade disposable razor which was the cheapest “over the counter” blade I could find. I didn’t like it because it was cheaply made and didn’t give me a good shave. It grabbed my hairs and pulled and the blades got clogged up almost immediately. Basically that cheap blade from the drug store sucked big time. Then I found the Dollar Shave Club Humble Twin and I am happy with it. It doesn’t shave quite as close as the over the counter 3 and four blade designs, but it is head and shoulders above the cheap disposable brands that I was using to cut costs. …THEN I get just as close a shave with The Humble Twin as I get using the hugely more expensive 3 and 4 blades I used to use from the drugstore back in the day when I had a full time job and was pulling down 40K a year. How long does 5 blades last? Well that depends on how much you shave. Which is why I gave you all that info above about how I shave. Because I have a beard, I only have to shave PART of my face when I shave. And I can skip shaving for quite a while before it begins to look shaggy. Normally, I tend to shave about once a week when I have no dance lessons or teaching gigs. IF I am VERY busy and doing something every day, then I shave every other day. So, for me 5 blades lasts me about 2 months. I was on the 1 month plan for the first three months, to build up a supply, then I switched to the “every other month” option. I’ve never run out and often postpone shipments because I have enough blades on hand. Often I don’t need any more blades — I have plenty on hand. So, when Dollar Shave Club sends me their “reminder” email that they are about to ship me some blades, I click on the link in the email, and go and “postpone” the shipment to either a month from now or two months from now depending on when I think I’ll need the next batch of replacement blades. 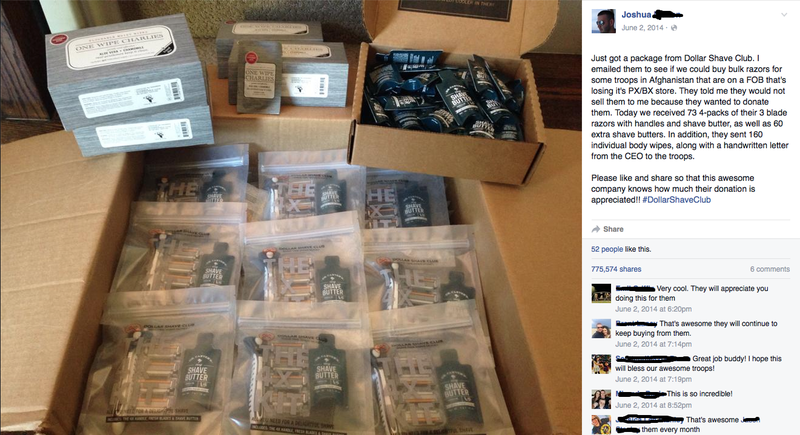 The Dollar Shave Club has lots of other products you can buy. Gels, and creams and lotions and they also have two other models of blades. I have not tried any of those other products. When I do or IF I do, then I’ll do a separate review of those specific products. If you haven’t seen Dollar Shave Club‘s web ad / video, then you are in for a treat. It is funny. Note: If you’re at work, you might want to keep the sound turned down. And depending on how you feel about bleeped out swear words and little ears you might want to make sure the kids are in the other room. Enjoy! If you decide to join Dollar Shave Club, I get a $5 coupon that I can apply to future orders from Dollar Shave Club. If you click on the link to the Edge Gel for Sensitive Skin and actually buy it then I get a small commission that is a few pennies from Amazon for the referral. Posted on Sat, Dec 19, 2015, in Product Reviews and tagged blade, blades, cheap blades, Dollar Shave Club, dollarshaveclub.com, edge shave gel, low cost razors, product review, razor, razors, replacement razor blades, review, shaving cream. Bookmark the permalink. Leave a comment.